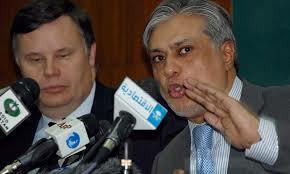 On Saturday, 10th May 2014, Pakistan's Finance Minister, Ishaq Dar, held a press conference along with IMF’s Pakistan mission chief, Jeffrey Franks, and announced an agreement on the budget 2014-15 framework. According to the agreement, Rs.220 billion in new taxes will be levied, power subsidies reduced and import duties lowered in three years. In Pakistan, democratic and dictator rulers always get their budgets approved by the IMF, which is a Western colonialist tool, all the while deceiving the people by claiming that the budget is “home-grown.” The Finance Minster of the Raheel-Nawaz regime has shown by publicly announcing the agreement fixed with IMF, in a crowded press conference, that Pakistan, a nuclear state country of 180 million people, is certainly not independent in her economic affairs. The agreement with the IMF, regarding the 2014-15 budget, will enslave Pakistan’s economy to international colonialist institutions, whilst local industry and agriculture will be further destroyed. Rs.220 billion in new taxes and reduction in power subsidies means that the cost of raw material and inputs for local industry and agriculture will increase dramatically, resulting in costly production. On top of that, lowering of import duties will diminish the ability of local goods to compete with low cost imported goods from foreign manufacturers. And that will result in the closure of even more local industry, greater losses in agriculture production and worsening unemployment. This is the shameful reality of Pakistan’s budget, which has been shown by our “capable” finance minister, several weeks before his budget speech, as being “imported”. However, the regime will still insist that the upcoming budget will be “homegrown,” made according to the interests of the country and its people. Democratic and dictator rulers safeguard the interests of their Western masters, particularly America, and make sure that the industry and agriculture of Pakistan are ruined, so that Pakistan can never become an economic power and will always be compelled to follow American instructions. Democracy and dictatorship have driven Pakistan into the ground. Pakistan needs a constitution which is derived solely from Quran and Sunnah because only an Islamic constitution can raise Pakistan to its actual potential. Only a Khilafah state will implement such an Islamic constitution which will give the right to the state to generate huge revenues by managing the natural resources like oil, gas, minerals and electricity as they fall under public property, receive Khiraj and Usher from agriculture sector, Zakat on industrial products and don’t levy any tax on poor. These revenue resources prescribed by Islam generate so much revenue that the state does not need foreign loans. Thus the Khilafah will finally liberate these lands from the dictations of the Western colonialist financial institutions and that is soon inshaaAllah.